I'm very happy when I slice this bread. The pesto swirl embedded inside the bread is perfect! Without butter and only 2 tbsp of olive oil added, this bread is surprisingly very fluffy in texture and very delicious too! Three cheers for this fantastic recipe! 1. Add water, milk and oil into bread machine pan in order according to manufactures directions. 2. Sprinkle over the flour, ensuring that it covers the liquid mixture completely. Add the sugar and salt, placing them in separate corners of the bread pan. 3. Make a small indent in the center of the flour and pour the dried yeast into the hollow. 4. Set the bread machine to the dough setting. Press start. Lightly oil a 25cm x 10cm loaf tin. 5. When the cycle has finished, remove the dough from the machine and place it on a lightly floured surface. Knock it back gently, then roll it out to a rectangle about 2cm thickness and 25cm long. Cover and let rest a few mins. 6. Spread pesto sauce over dough. Leave 1 cm border along one long edge. 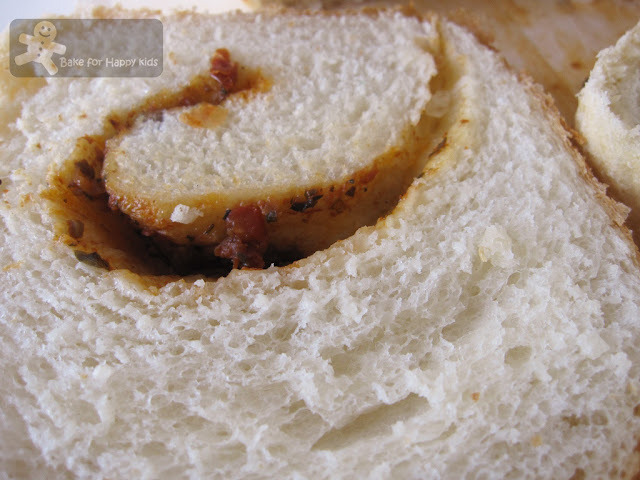 Roll up dough lengthwise and tuck ends under and place seam down in a prepared loaf pan. 7. Cover with oiled clear film and set aside in a warm place to rise for 45 min or until it doubled its size. Preheat oven to 220°C (200°C fan forced). 8.Remove the clear fim and brush olive oil over the top. Using a sharp knife to score the top with four with 4 diagonal cuts. Repeat the cuts in the opposite direction. Sprinkle with sea salt. Bake 25 to 30 minutes, until the bread is golden and sounds hollow when tapped on the bottom. Turn onto a wire rack to cool. Note: With 10cm x 20cm loaf tin, I use 80% of this recipe to make this bread. I didn't score my bread as I prefer this bread with a nice dome top. Zoe this is very beautiful bread...I never tried with pesto, but sounds so tempting! Thanks for sharing!! wow it looks so ordinary on the outside but the inside looks fantastic! I also love the idea of the pesto and sun dried tomato pesto must be delicious! I also like the coarse grains of salt on top - I bet it makes each bite so wonderfully salty! Wow! It does look very soft and yummy. My friend loves pesto, maybe I'll make this one day for her. :) thanks for the recipe. 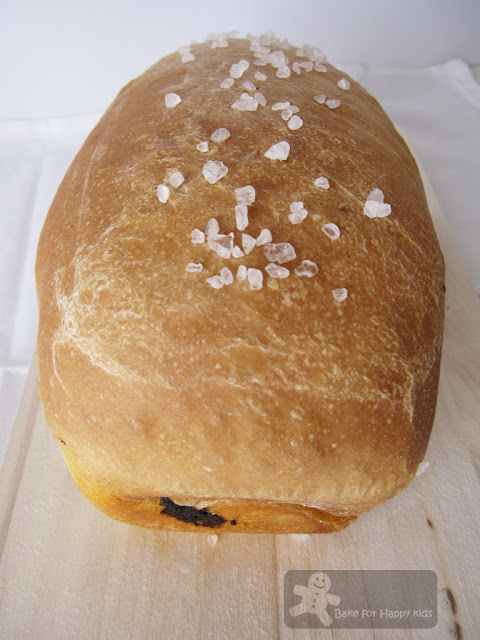 You always make such good breads and so creative with the flavors. I love pesto so bookmarked to try this soon. Have a nice day. Beautiful bread, so soft & fluffy. This is beautiful bread, Zoe! I bet it tasted great too. Thats such a soft and fluffy bread. yes, pesto taste great in breads, i made that with pizza too! that's a beautiful loaf!! 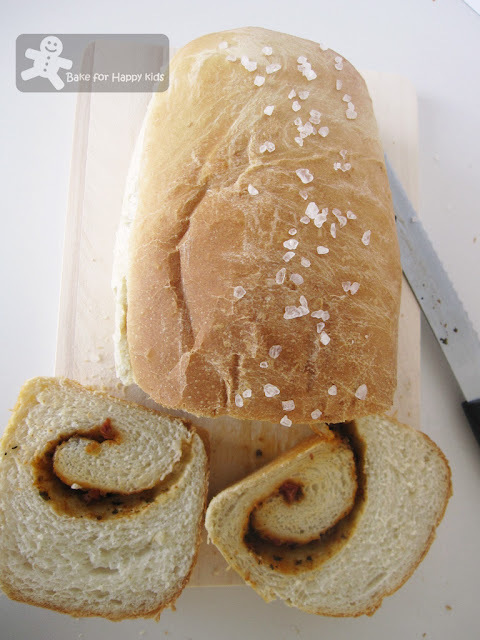 What a great idea to put pesto in the bread - really lovely - this would be a big hit with my family! Can't wait to try this; I have been making a lot of pesto this year; really intersted in your dried tomato pesto. That's a perfect loaf of bread! Zoe, you've just tempted me to make some bread. I love pesto in anything. Yours look great! What a wonderful bread with the swirl of pesto in there! I love it! Oh my goodness, this sounds so, so incredible. You always share the most unique recipes. I can't wait to make this. I would immediately break the bread and eat the portion where the pesto is.. definitely! YUM! oh what a great idea for bread! Hi, I don't have a bread machine, would like to bake this bread, any advice? Sprinkle yeast over a smaller amount of warm milk in a small bowl. Mix and let it stand for 5 min or until frothy. Pour into the mixer bowl, add the rest of liquid, sugar and oil whisk to combine. Attach the bowl to mixer and fit with hook attachment. On low speed, add enough flour and salt to make a soft dough that cleans the bowl. Knead the dough until smooth and elastic and can more than 6 min. Place dough in the lightly greased bowl. Cover tightly with plastic wrap. Let stand in a warm place until dough doubles in volume about 1 hrs. From here, you can continue step 5 of this recipe. Have fun baking.